The western edge of the African Plate is a divergent boundary with the North American Plate to the north and the South American Plate to the south which forms the central and southern part of the Mid-Atlantic Ridge. 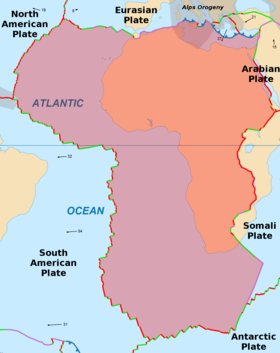 The African plate is bounded on the northeast by the Arabian Plate, the southeast by the Somali Plate, the north by the Eurasian Plate, the Aegean Sea Plate, and the Anatolian Plate, and on the south by the Antarctic Plate. All of these are divergent or spreading boundaries with the exception of the northern boundary and a short segment near the Azores known as the Terceira Rift. The African Plate includes several cratons, stable blocks of old crust with deep roots in the subcontinental lithospheric mantle, and less stable terranes, which came together to form the African continent during the assembly of the supercontinent Pangea around 550 million years ago. The cratons are, from south to north, the Kalahari Craton, Congo Craton, Tanzania Craton and West African Craton. The cratons were widely separated in the past, but came together during the Pan-African orogeny and stayed together when Gondwana split up. The cratons are connected by orogenic belts, regions of highly deformed rock where the tectonic plates have engaged. The Saharan Metacraton has been tentatively identified as the remains of a craton that has become detached from the subcontinental lithospheric mantle, but alternatively may consist of a collection of unrelated crustal fragments swept together during the Pan-African orogeny. In some areas, the cratons are covered by sedimentary basins, such as the Tindouf Basin, Taoudeni Basin and Congo Basin, where the underlying archaic crust is overlaid by more recent Neoproterozoic sediments. The plate includes shear zones such as the Central African Shear Zone (CASZ) where, in the past, two sections of the crust were moving in opposite directions, and rifts such as the Anza Trough where the crust was pulled apart, and the resulting depression filled with more modern sediment. Map of East Africa showing some of the historically active volcanoes(red triangles) and the Afar Triangle (shaded, center) -- a triple junction where three plates are pulling away from one another: the Arabian Plate, the African Plate, and the Somali Plate (USGS). 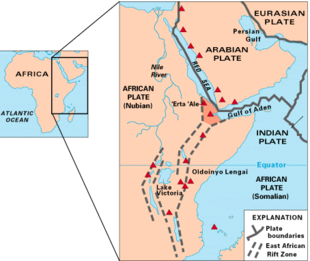 The African Plate is rifting in the eastern interior of the African continent along the East African Rift. This rift zone separates the African Plate to the west from the Somali Plate to the east. One hypothesis proposes the existence of a mantle plume beneath the Afar region, whereas an opposing hypothesis asserts that the rifting is merely a zone of maximum weakness where the African Plate is deforming as plates to its east are moving rapidly northward. The African Plate's speed is estimated at around 2.15 cm (0.85 in) per year. It has been moving over the past 100 million years or so in a general northeast direction. This is drawing it closer to the Eurasian Plate, causing subduction where oceanic crust is converging with continental crust (e.g. portions of the central and eastern Mediterranean). In the western Mediterranean, the relative motions of the Eurasian and African plates produce a combination of lateral and compressive forces, concentrated in a zone known as the Azores–Gibraltar Fault Zone. Along its northeast margin, the African Plate is bounded by the Red Sea Rift where the Arabian Plate is moving away from the African Plate. The New England hotspot in the Atlantic Ocean has probably created a short line of mid- to late-Tertiary age seamounts on the African Plate but appears to be currently inactive. ^ Chu, D.; Gordon, R. G. (1999). "Evidence for motion between Nubia and Somalia along the Southwest Indian ridge". Nature. 398 (6722): 64–67. Bibcode:1999Natur.398...64C. doi:10.1038/18014. Retrieved 20 June 2015. ^ Huang, Zhen Shao (1997). "Speed of the Continental Plates". The Physics Factbook. Retrieved 7 June 2018. ^ Duncan, R. A. (1984). "Age progressive volcanism in the New England Seamounts and the opening of the central Atlantic Ocean". Journal of Geophysical Research: Solid Earth. 89 (B12): 9980–9990. Bibcode:1984JGR....89.9980D. doi:10.1029/jb089ib12p09980. Meijer, P. Th. ; Wortel, M. J. R. (1999). "Cenozoic dynamics of the African plate with emphasis on the Africa-Eurasia collision". Journal of Geophysical Research: Solid Earth. 104 (B4): 7405–7418. Bibcode:1999JGR...104.7405M. doi:10.1029/1999JB900009.